When Havells acquired Sylvania in 2007, all that it was looking for was growth and a strong global presence. Instead, it had to grapple with a major crisis at Sylvania, triggered by the global financial turmoil. The situation threatened to pull Havells down, and it had to come up with a smart turnaround strategy. Executive Summary: When electrical goods company Havells acquired Sylvania in 2007, all that it was looking for was growth and a strong global presence. Instead, it had to grapple with a major crisis at Sylvania, triggered by the global financial turmoil. The situation threatened to pull Havells down, and it had to come up with a smart turnaround strategy. This case study looks at how Havells pulled it off. Qimat Rai Gupta quit his job teaching in a school in Punjab, and came to Delhi in 1958 with Rs 10,000 in hand. He started an electrical goods trading company in the old part of the city, but the market was too small for his ambitions. He spotted an opportunity in the distressed Havells brand, named after its founder, Haveli Ram Gupta. He bought it for around Rs 7 lakh in 1971, and followed up with a series of acquisitions, joint ventures and entry into new product categories. Today, Havells India Ltd is a Rs 7,248-crore company. The journey hasn't always been smooth, but the roughest patch was easily the 2007 acquisition of German lighting and fixtures maker SLI Lighting, owner of the Sylvania brand. 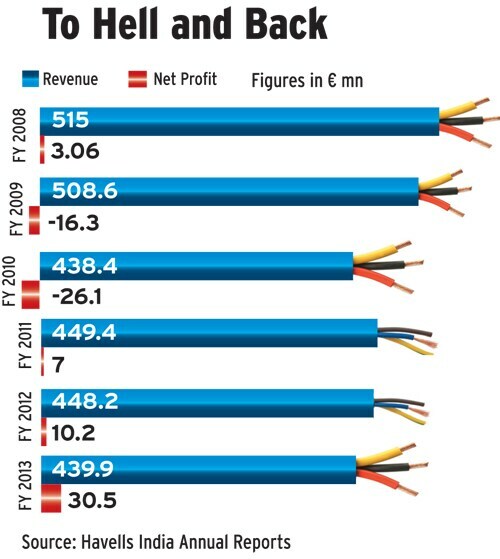 SLI was then the world's fourth-largest lighting company and 1.5 times bigger than Havells. It took Gupta minutes to make up his mind about buying it, while his senior management - including son Anil Rai Gupta, nephew Ameet Gupta and Group CFO Rajesh Gupta - were still weighing the pros and cons. In February 2007, when negotiations with Sylvania's owners took place, some of Havells's top bosses flew to London to seal the deal. Anil, Havells's Joint Managing Director, recalls the sleepless night before they signed on the dotted line. He and cousin Ameet reckoned they were paying more than they should. "The next morning, I called my father," says Anil. "I told him we have paid i3 million (Rs 23.4 crore today) more. He said that in the big picture, the figure was insignificant." Havells bought Sylvania for i200 million, plus pension liabilities of i35 million. Qimat Rai was betting on Sylvania's strong 100-year-old brand in about 50 countries, and its worldwide network of 10,000 distributors and dealers. "My father said we would not be able to replicate these two things," says Anil. Havells had a track record of five successful acquisitions, and high growth in its Indian operations. In 1983, it bought the loss-making Delhi-based Towers and Transformers Ltd and turned it around in a year. Between 1997 and 2001, Havells also bought ECS, Duke Arnics Electronics, Standard Electricals and Crabtree India. The last was a 50:50 joint venture between Havells and the UK-based Crabtree, and Havells later acquired Crabtree's stake in the JV. India revenues had a compound annual growth rate of 50.08 per cent between 2002/03 and 2007/08. In March 2007, Havells bought Sylvania. And then the global financial crisis struck. As the meltdown rocked European markets, Sylvania's sales fell, leading to net losses of Euro 16.3 million in 2008/09 and Euro 26.1 million in 2009/10. From Euro 515 million in 2007/08, revenues dropped to Euro 438.4 million in two years. Trusting Sylvania's management to deal with the situation turned out to be a mistake on Havells's part. Paul Griswold, then CEO of Havells Sylvania, was hired by the company's previous owners, a group of private equity investors that included DDJ Capital, Cerberus Capital Management and JP Morgan. He had turned Sylvania around after it slipped into bankruptcy in 2002 and made it profitable before Havells bought it, but the magic touch eluded him now. The Havells management sacked him. In September 2008, Sylvania's bankers, led by Barclays Capital, hit the panic button as the company breached its covenants. Put in place by lenders, covenants are a set of financial ratios that the borrower must maintain. Sylvania's acquisition was funded by debt - a Euro 120-million loan based on operating cash flows and an Euro 80-million loan taken out by a Havells subsidiary. Havells repaid i80 million by raising money from the sale of a stake to Warburg Pincus. "Covenant breach was as good as repayment default," says CFO Rajesh Gupta. "The bankers asked us to repay the loan or hand over the company to them." Sylvania's poor performance began to affect consolidated numbers, but Havells's growth in domestic operations made up for Sylvania's losses - for a while, at least. For the Guptas, it wasn't just their money but also their reputation at stake. Havells's top management drew up an 18-month restructuring plan. In the first phase, called Phoenix (January to September 2009), the aim was to improve profitability by cutting manpower costs and closing factories. The second phase, called Prakram (September 2009 to June 2010), focused on further reducing the headcount, and increasing the sourcing of products from low-cost locations such as India and China. Layoffs were a challenge, as severance packages cost money and can hurt sales. "The first three months were difficult," says Anil. "We had meetings with the top people at Sylvania. In the beginning, some didn't agree with us, but with more meetings, more people turned believers." The next challenge was to persuade banks, which were reluctant to fund the restructuring plan. It didn't help that the Indian electricals market had crashed. "We told the banks we had goofed up, and asked them to give us six months," says Ameet, who is Executive Director at Havells. The banks agreed only to a twomonth deferral of repayment of loans, helping Havells with a Euro 24-million cushion for that period. So Havells poured some Euro 12 million into the restructuring plan. To begin with, a factory each in Brazil and Costa Rica were closed. Operations at a UK factory were suspended and shifted to India, where labour accounts for four to five per cent of the total cost (in Europe, it accounts for 22 per cent). Noncritical staff - accounts, IT, factory personnel - in European and Latin American operations was also laid off. Some back-office jobs were shifted to India. The total headcount of 3,800 (at the start of 2009) was reduced by 41 per cent to 2,233. Remarkably, the layoffs did not result in a single day's strike. The company strictly followed labour laws in each country, and ensured that final settlements went off smoothly. "We would give out payments before the due date," says CFO Gupta. Both phases together led to annual savings of Euro 34.4 million. The company also spent around Euro 4 million less on the restructuring than the Euro 36 million anticipated. Besides reducing the headcount, several areas were targeted including logistics, inventory management, and product pricing. Havells worked closely with logistics companies and shut down some warehouses, reducing logistics costs from 14 to six per cent of total cost. To reduce the working capital requirement, the amount of inventory at the company level was cut from Euro 70-75 million to Euro 40 million without affecting the ability to serve customers on time. Since 2007, outsourcing from India and China has jumped from 38 to 60 per cent. Sylvania's products were priced 15 per cent lower than those of rivals Philips, Osram and GE. This was of little help to Sylvania, which makes high-end products, and also diluted the brand. "We raised prices in Europe and Latin America by five to eight per cent," says Sylvania's global operations head Rajiv Goel. He adds: "For some 20-odd years, Sylvania was owned by financial institutions looking for short-term gains. We told employees that we are here for the long term." Angelica Valderrama, head of Mexican operations, who joined Sylvania 15 years ago, says: "Unlike the earlier management, we were given flexibility to think about new ways to earn profits." The results soon began to show. In 2010/11, Sylvania made a net profit of Euro 7 million on revenues of Euro 449.4 million. Since then, profits have grown steadily: Euro 10.2 million in 2011/12 and Euro 30.5 million in 2012/13, although revenues stayed somewhat flat (Euro 449.4 million in 2011/12 and Euro 439.9 million in 2012/13). The company has seven factories (it closed one more in the UK in 2009) and a workforce of 2,200 in 50 countries. The persistent slowdown in Europe remains a concern for Sylvania. Europe contributes 55 per cent to its top line, down from 70 per cent some years ago. "The macroeconomic situation in Europe is not hunky-dory," says Rahul Gajare, analyst at Edelweiss Securities. "The construction sector in Europe, which is expected to drive Sylvania's growth, is subdued." Joint Managing Director Anil says Sylvania will grow through acquisitions in areas such as lighting, switches and mini circuit breakers. "We have the financial capability and managerial bandwidth to make a i50-200 million acquisition." Soon after the restructuring, Sylvania shifted its global headquarters from Frankfurt to London with the aim of multiplying its growth prospects. The brand has literally gone places - among the things it lights up are the National Museum in New Delhi, Madame Tussauds in London, the Channel Tunnel and IndiGo aircraft. A sequential process involving strategy, plans, identification of possible targets, negotiation, evaluation, streamlining of the final deal, value creation, culture fit and growth aids a successful acquisition. Valuation techniques which take into consideration synergies accruing to buyer and seller, digressions, deal structure, performance measures, cost, market, management of talent, accountability and so on are other critical issues in evaluating a marriage between two companies. The final critical point is that the agreed value of an M&A deal needs to be justified by sales turnover, profitability, cash flows and so on, which the acquisition is supposed to yield. Without establishing the worth of these variables, it is impossible to identify the value of the company being taken over. This said, the Euro 3 million excess paid for Sylvania is marginal, considering the value of the deal was Euro 200 million. Even after doing all this, the decision to execute a cross-border takeover of a company that is 1.5 times bigger than the acquirer, with worldwide sales and production, is not easy. It appears that much of Havells's post-merger problems was due to environmental factors - an economic downturn and Sylvania's operational inefficiencies. In fact, this can be seen as a blessing in disguise - many tough decisions such as restructuring and layoffs find greater acceptability among staff when the environment is bad. Havells's decisions to close three factories, increase sourcing from cheaper markets, move their focus to Latin America and Asia, and reduce dependence on European markets, competitive pricing, and so on were all steps in the right direction. Likewise, fixed cost reduction was an important first step in the turnaround. Havells also involved the local management in decision-making and let go of their ineffective CEO. True, they could have done this earlier, but it is important to time and sequence one's moves so they don't backfire. It takes time for the results of broad-based changes to show, and HaveIls has recorded increasing profits year-on-year since 2011. Indian companies' overseas forays have had mixed results. For every JLR, there is a Corus, and for every Taro there is a Zain or an Imperial. If one looks at India Inc's 20 largest overseas deals so far, the majority appear to have hurt financial health. The issue could be the price paid, financing, the global economic scenario, or how the company went about managing its investees after the acquisition. The last is possibly the most important. From the large number of overseas purchases by emerging Indian majors, Havells's acquisition of Sylvania is amongst those that have got the most attention. It is easy to see why. It is a turnaround story - something larger Indian companies have struggled to achieve. Two things contributed to Havells's success in turning Sylvania around: acceptance of the challenges facing Sylvania a year after the acquisition, and the collaborative way in which restructuring was carried out. In the year following the acquisition, Havells let the business run as is. As it began to struggle, it was quick to learn that Sylvania's business had been reconstructed few years earlier by private equity investors. What was missing, however, was the passion to create a sustainable business, something that Havells itself has done over the years. It redeployed its thin management resources to Sylvania and launched a restructuring programme. Some senior executives left. Havells worked with the second line of Sylvania's management to turn around the business together. Havells was able to convey that it was not "taking over", but sought to work jointly with the local management to salvage the Sylvania brand (where Havells saw great value). Havells sought to ease supplyside bottlenecks and restructure operating costs, including headcount reduction. The strategies were largely executed by the local management, so the restructuring seemed to be about "us", rather than "we" and "they". I attribute the success of Sylvania's restructuring to the Havells leadership. It is an example for India Inc.